Arsenal are close to agreeing deals to sign Nigerian under-17 prospects Kelechi Nwakali and Samuel Chukwueze, sources have told ESPN FC. 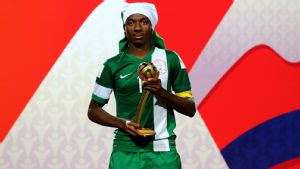 A host of Europe's top clubs have been tracking Nwakali and Chukwueze after they impressed in helping Nigeria win last year's FIFA U17 World Cup in Chile. Manchester City -- who Nwakali's brother Chidiebere is contracted to -- and Bayern Munich have been credited with an interest in the midfield pair, but Arsenal are in pole position to land the exciting duo. Nwakali, 17, was named as player of the tournament at the U17 World Cup, while Chukwueze, 16, also impressed for the Golden Eaglets. Sources have told ESPN FC that talks are at an advanced stage between Arsenal and the two teenagers, and the Gunners are hopeful of securing the duo before the close of the January transfer window. Nwakali, Chukwueze and Egypt international Mohamed Elneny are set to be the only signings made by Arsenal during this month's transfer window, sources have told ESPN FC.